Mission trips are all about doing good for others while deepening your own faith. 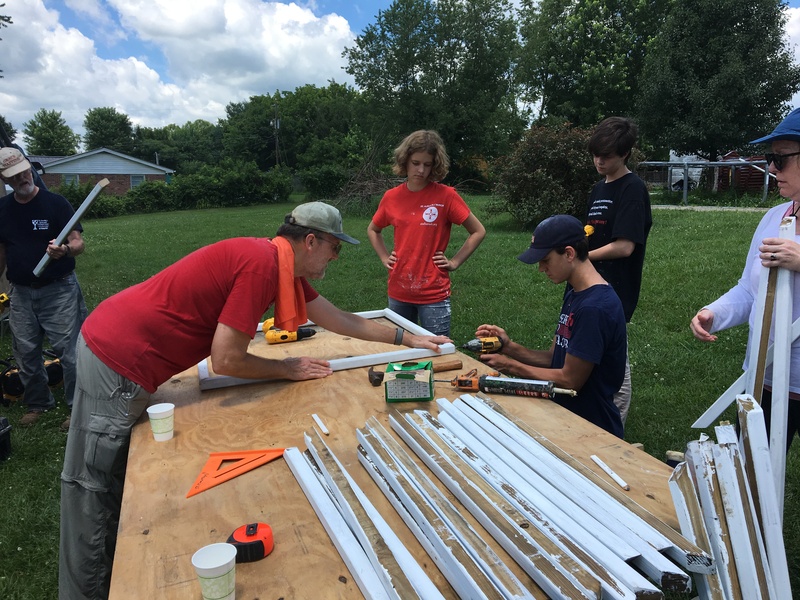 This year’s mission to Kentucky involved the expected home repairs, morning devotions, and a nightly service of Compline, but it also held some surprises for the St. Alban’s team. The trip inaugurated a partnership between our church and St. Timothy’s Episcopal Outreach Center in Estill County, one of the poorest parts of Appalachia. The team’s first task was not roofing or flooring but carpentry. And what they built was a pine casket for a man who was terminally ill and couldn’t afford a coffin. Casket-building also made an impression on Charles Porter, one of the adult leaders. “It was for me a powerful message about the challenges of life and even of death for those who struggle to make ends meet,” he said. The group learned first-hand about rural poverty and its consequences. When they fixed the leaks in a boy’s bedroom so he could move back in and stop sleeping on the couch, they learned that the boy can’t read. He’s 10 years old. St. Tim’s is well equipped for groups like ours. Participants stay in bunk rooms and cook their own meals. No sleeping on the floor or eating the cafeteria food many St. Albanites remember from years of Appalachia Service Project trips. “We ate well, played well and worked hard,” said the Rev’d Geoffrey Hoare. At the Thursday night community dinner, Sage Hoare talked to some older women who’ve lived in the area their whole lives. Many are bringing up grandchildren whose parents are out of the picture due to drugs or illness. “I was struck by those women being willing to share their stories so forthrightly,” Sage said. To her, the trip was a chance to live out the Baptismal covenant promise to "strive for justice and peace among all people, and respect the dignity of every human being." Everyone learned something on the trip. Ruthie and Henry discovered a love for power tools. Charles brought his guitar and taught the group new songs. And Allison, one of the youth participants, discovered that differences don't have to divide us. St. Alban’s will send another group of youth and adults to St. Tim’s the week of June 17, 2019. Contact Geoffrey to learn more. Another beautiful chapter in this story of renewal. Thanks and congratulations to all of you who do this work, year after year.